The National Weather Service confirmed that two EF-0 tornadoes touched down in Fort Lauderdale Tuesday afternoon. According to the National Weather Service in Miami, one tornado touched down in downtown Fort Lauderdale near Andrews Avenue and NE 5th Street at about 3:34 p.m. The tornado, packing winds of 65 mph, knocked over construction fencing and barriers. A minor tree damage was reported near NE 1st Avenue and NE 4th Street. The NWS says the tornado touched down south of the Tarpon River in the Rio Vista neighborhood, causing tree damages and minor debris, including trash cans. The second tornado touched down on the northwest portion of the Fort Lauderdale-Hollywood International Airport around 4:25 p.m. The NWS said multiple videos by witnesses showed the tornado touched down along the northwestern side of Fort Lauderdale-Hollywood International Airport near Interstate 595, leading to damage to cargo and storage containers in the FedEx facility on the north side of the airfield. The tornado, with wind speeds of 84 mph, then moved east-southeast along the airport's northern taxiway, causing damage to a jet bridge on the north side of the terminal. 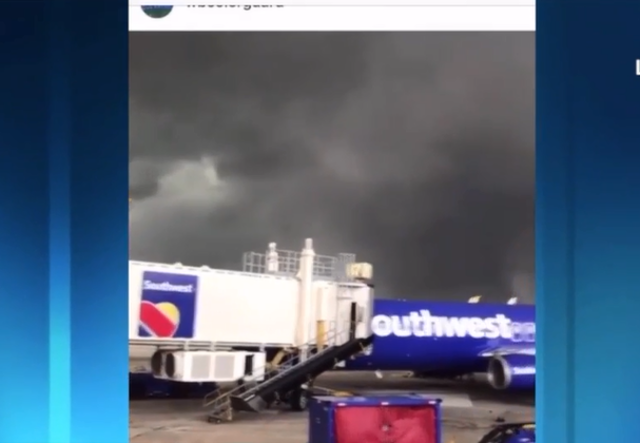 Gregory Meyer with the Broward County Aviation Department, said in a news release that at approximately 4:40 p.m. severe weather moved into the airport, causing flight delays and temporary closure of a runway. A jet bridge on the north side of the terminal was damaged. The tornado also caused damage to cargo and storage containers in the FedEx facility. The tornado then moved into the extreme southern end of Port Everglades, where multiple cargo containers were flipped and damaged, along with eyewitness reports of port-a-johns being tossed about. The tornado then likely crossed the Intracoastal Waterway before moving offshore into the Atlantic Ocean. The attached video was recorded by Blair Wallace.